High-speed Eye Mask test and Eye pattern analysis at 150 ksample/s max. The BERTWave MP2100B is an all-in-one test set with built-in BERT and sampling oscilloscope supporting evaluation of optical modules, including BER measurements, Eye Mask tests, Eye pattern analyses, etc. 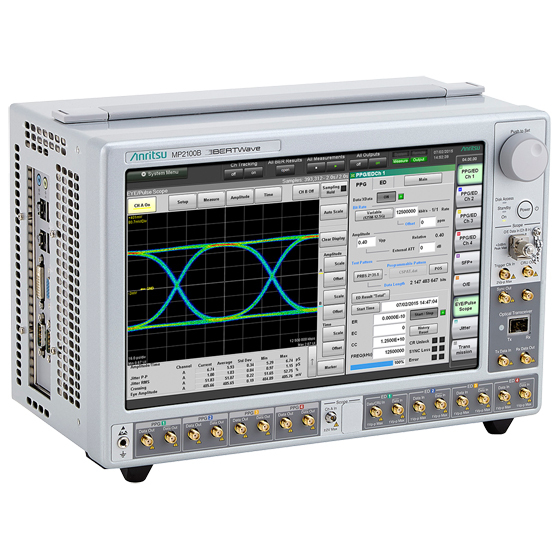 A BERT and sampling oscilloscope are required measuring instruments for evaluating optical modules used by optical communications systems. Previous evaluations of optical modules, such as QSFP+ and SFP+ modules, required provision of a separate BERT and sampling oscilloscope. However, the BERTWave MP2100B incorporates a BERT supporting up to 4 channels as well as a sampling oscilloscope in a single, compact, 18 cm deep cabinet, slashing equipment investment costs and saving bench-top space. In addition, the BERTWave MP2100B reduces measurement times by eliminating the need to change cable connections at simultaneous BER measurements, Eye Mask tests, and Eye pattern analyses. Moreover, since the number of BER measurement channels can be expanded to four, 4-channel BER measurements, Eye Mask tests and Eye pattern analyses can be run simultaneously. Last, built-in support for SFP+ modules eliminates the need for a separate light source. 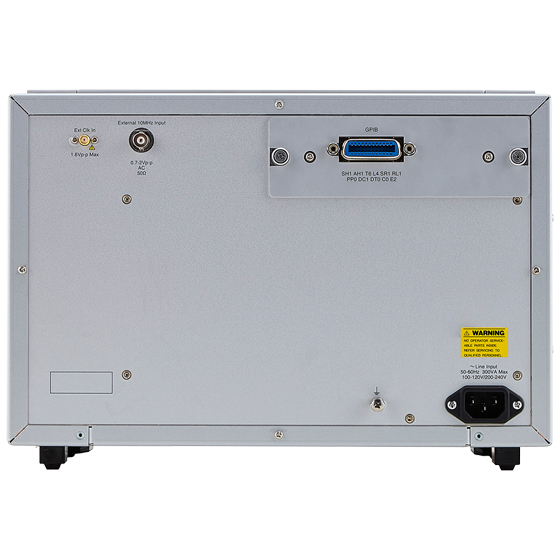 The BERTWave MP2100B BERT function supports BER measurements at speeds ranging from 125 Mbit/s to 12.5 Gbit/s; its built-in 4ch BERT option makes it easy to configure test systems for multichannel modules, such as QSFP+ and AOC. Further, in addition to supporting BER measurements for differential signals, it also supports Eye Mask and Eye pattern Measurements. 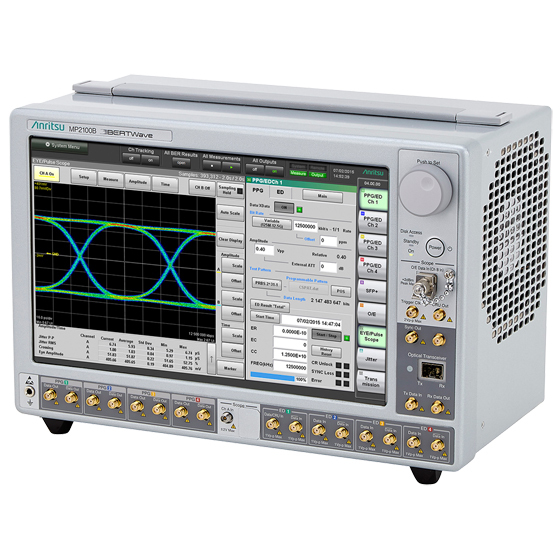 The BERTWave MP2100B sampling oscilloscope has a bandwidth of 25 GHz (typ.) 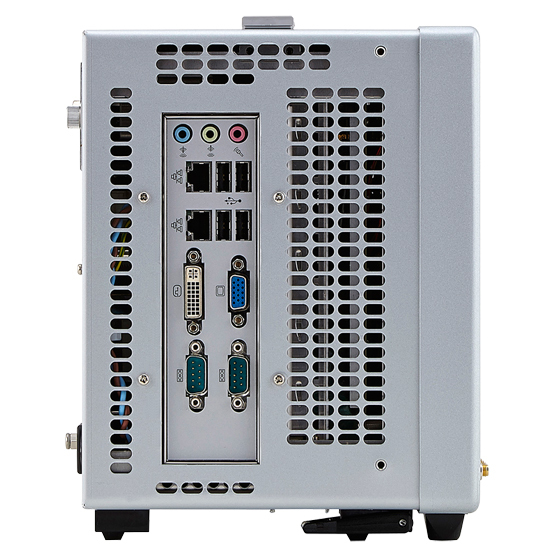 for electrical interfaces and a bandwidth of 9 GHz (typ.) for optical interfaces. In addition, up to six optional Bessel filters can be built-in for measuring optical signals using the scope. Using these filters, MP2100B supports extinction ratio measurements, Eye Mask tests and Eye pattern analyses for various applications. Further, the scope has a Fast Sampling Mode to secure the fastest high-speed measurements; sampling speeds of up to 150 ksample/s are supported by Fast Sampling Mode, which is 1.5 times faster than legacy models and supports time-saving high-speed Eye Mask tests and Eye pattern analyses. Using the Jitter Analysis MX210001A software facilitates easy all-in-one simultaneous Jitter analysis, Eye pattern and Eye Mask measurements and the 150 ksample/s sampling speed makes even more efficient use of measurement time. Combined use with MATLAB® supports waveform dispersion measurements for specific signals, such as WDP, TWDP, and dWDP waveforms. Last, the Transmission Analysis MX210002A software adds functions for analyzing device transmission (S21 gain and phase), plus a De-Embedded waveform simulation function executed by linear equalizer, filter, and Emphasis calculations. Simultaneous waveform sampling and simulation as well as simultaneous Eye pattern and Eye Mask measurements are supported. Combined use with the MX210001A software also enables simultaneous Jitter measurements of simulated waveforms. MATLAB® is a registered trademark of The MathWorks Inc.
Bandwidth (-3 dB) Electrical: DC to 20 GHz minimum, DC to 25 GHz typ. 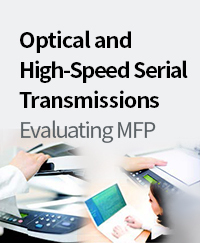 Evaluation of Transmissions Within and Between Video Transmission Equipment, etc. The Jitter Analysis Software MX210001A has high-speed and Jitter-measurement functions supporting all-in-one measurements, such as simultaneous Jitter analysis, Eye Pattern measurement and Eye Mask test measurements. The Transmission Analysis Software MX210002A to the BERTWave supports Tx analyses (S21 Gain, Phase), and waveform simulation (de-embedded) using linear equalizer, filter, and emphasis operations; simultaneous waveform sampling and simulation support simultaneous Eye Pattern measurement and Eye Mask test measurements. Furthermore, combined tracking with the MX210001A software permits simultaneous Jitter measurement of simulated waveforms. 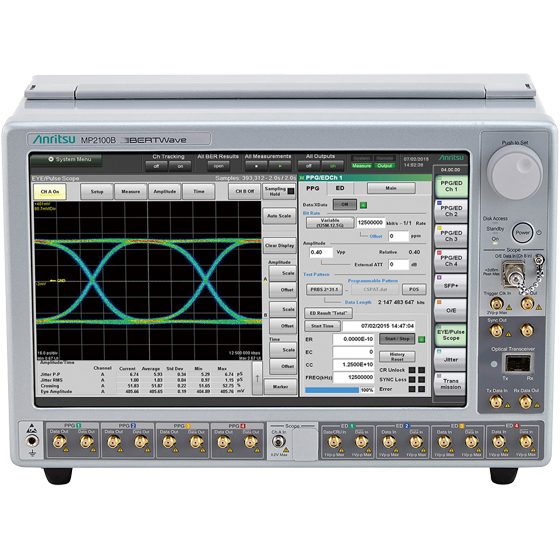 The BERTWave MP2100B is a all-in-one tester with integrated 4ch BERT and sampling oscilloscope.